Myles Nelson McKenzie Design of Newport Beach, California has won “Best Of Customer Service” on Houzz®, the leading platform for home remodeling and design. The 30-year old residential and commercial design firm was chosen by the more than 35 million monthly unique users that comprise the Houzz community from among more than one million active home building, remodeling and design industry professionals. "At Myles Nelson McKenzie Design, we feel that communication with our clients can be pivotal in developing a project design and finally, construction plans for a new custom home, home remodel or commercial tenant improvement project. 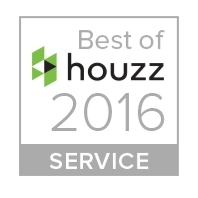 We are honored to be chosen by Houzz, the 'Best Of Houzz 2016' in the 'Customer Service' category." Myles Nelson McKenzie Design in Newport Beach California has been serving clients throughout Orange County, Los Angeles and Santa Barbara Counties for the last 30 years. Providing custom project design and CAD drawn construction plans for custom new homes, home remodels, room additions and commercial tenant improvement projects. With our project architects, civil and structural engineers, we can provide design and cad services for any size project. For more information, visit mylesmckenzie.com.